Today I found out what causes the pain in your side you may occasionally feel while running or doing other jarring activities. This pain, known often as “side stitch” and more technically as “exercise related transient abdominal pain” (ETAP), often occurs while running, swimming, and horse riding, among others; it is caused by various stresses on your diaphragm that result in strain on the ligaments connected to your diaphragm, as well as spasms or cramps in the diaphragm itself. These strained ligaments and cramps in turn cause the sharp pain you feel in your side. So what’s actually going on here? When you inhale, your diaphragm goes downward and contracts, when you exhale, your diaphragm rises and relaxes. Now consider what’s happening when you run, for instance. You are bouncing up and down while in turn breathing in and out. It turns out that most people naturally time their exhale with one of their feet striking the ground. When their foot strikes the ground, their organs are going down while their diaphragm is going up. This puts quite a bit of strain on the ligaments that are connected between the diaphragm and the various organs connected to it, such as your liver and stomach. Over time, this can cause pain due to strain on the ligaments and can also contribute to spasms in the diaphragm itself. Further complicating this latter issue of spasms is that, while this is all going on, your diaphragm will typically be getting less oxygen than normal, particularly for people who are out of shape. This has a twofold affect. First, muscles, such as the diaphragm, that are starved for oxygen will have a tendency to cramp more easily. The second effect is that, when you are out of breath, you will typically take shallow, quick breaths. When this is happening, your diaphragm is never really getting a chance to relax fully, rather staying somewhat flexed. This further exacerbates the problem with your ligaments, while also further starving the diaphragm of oxygen from constant flexing. Work those abs. Stronger abdominal muscles will do a better job of limiting the jarring on your internal organs and thus limiting the strain on the ligaments connected to the diaphragm. Avoid taking shallow, quick breaths. Breathe deeply and methodically while you are doing a jarring exercise. As noted, most people exhale as they land on one foot or the other. It turns out, about 70% of people exhale when they land on their left foot rather than their right. This is a good thing and will help prevent side stitches. When you exhale when landing on your right foot, it particularly causes extra strain on the ligaments between the liver and diaphragm, as well as added friction between the two. This is why most side stitches occur on the right side rather than the left. Thus, if you are in a race and you can’t stop just because of a side stitch, focus on exhaling when your left foot lands, instead of your right, as well as taking deep methodical breaths, rather than short quick ones as noted above. If, in this “can’t stop” case, you have a very rare left side stitch, focus on exhaling when your right foot strikes the ground until the side stitch goes away. Stretching will also help reduce the likelihood and help get rid of side stitches. Before running or doing some other jarring activity, warm up then do various abdominal stretches. If you already have a side stitch, try doing this simple stretching exercise while walking. Reach towards the sky as you inhale and let your arms slowly fall as you exhale. This will help relieve some of the tension in your diaphragm and help get rid of the side stitch. An alternative to the “reach for the sky” method is to press your fingers deeply into the area the pain is coming from and massage the area firmly while deeply breathing. This should accelerate the demise of the side stitch. Another preventative method is to avoid eating much of anything two or three hours before doing the jarring activity. An empty stomach takes up less room in your abdomen and is also lighter. Both of these things will help reduce the strain on the ligaments between the diaphragm and the stomach. As an added bonus, an empty stomach will also help you burn fat faster. Once your body runs dry of its readily available fuel stored in your muscles (glucose) and then liver (glycogen), it will look to your stomach for some makings of glucose (simple and complex carbohydrates). If the stomach is empty or otherwise lacks what your body needs there, it will switch gears and start getting what it needs from your body’s stored fat. Whether getting what it needs to make glucose from the contents of your stomach or from fat, you’ll feel this kick in when you get your “second wind”. Appendicitis can sometimes feel a bit like a side stitch, in the early stages. If you find you have a “side stitch” that sticks around for more than a few minutes after a side stitch normally should have gone away, you may want to go get that checked out to make sure you aren’t having appendix problems. If your side stitch spreads all the way up to your shoulder, you may not have a typical side stitch at all; you may be having a “mild” heart attack. About 70% of regular runners report experiencing side stitch at least once a year. 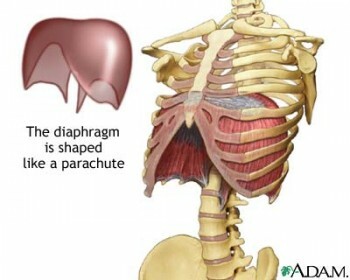 For those who don’t know, a “thoracic diaphragm” or more typically just “diaphragm” is an internal muscle that extends across the bottom of your rib cage. It has a few functions; one of which is it separates your lungs, heart, and ribs from your abdominal cavity. In humans, the diaphragm is also extremely important in breathing, as well as important in aiding in defecating, urinating, and vomiting; all of these by increasing abdominal pressure. It also helps in preventing acid reflux by exerting pressure on the esophagus. What Causes the Pain in My Side While I am Running? Why Do I Get a Sharp Pain in My Side When I am Jogging? I thought it was a buildup of lactic acid. The build up of acidity in the blood is the reason why the diaphragm has to work harder. Great article, I’ve always wondered this…. Why do these cramps happen more often when excess fluid intake is another question. It isn´t correct: “When you inhale, your diaphragm goes downward and relaxes, when you exhale, your diaphragm rises and becomes tense”. When you inhale your diaphragm becomes tense and goes downward (to decrease the pressure in the chest cavity: then air comes in your lungs); and when you exhale your diaphragm relaxes and rises (so the pressure increases into your lungs and air goes out). As what Caro has already stated, the diaphragmatic muscles constrict which causes it to descend(or flattens) and the lungs to expand, hence inspiration occurs. When it relaxes, it resumes it’s original position (dome-shaped) and the air in the lungs is expelled passively, known as expiration. Absolute nonsense. The side stitch is caused by your spleen contracting to push more oxygen-carrying red blood cells into your circulation. The spleen acts like a reservoir for blood. You’ll find that particular pain only on the upper left side of your abdomen. You can avoid the side stitch by gradually increasing exercise intensity, rather than going at a fast pace without a proper warm-up. Also, this pain is completely normal, so you can continue exercising and it will eventually go away without damaging any organs. Wikipedia. But it is kind of common knowledge. I’ve had a side pain for 3 years…It feels exactly like the “Side Aches” we experience while running.. I went to ER…..They did an ultrasound & found nothing but kept me 3 days administering s pain shot every 4 hrs til I stopped them..( I wanted DR to see exactly where pain is….I saw a Dr for 5 minutes….Didn’t even touch me..He tld me to make appt at his office….I didn’t…. I have chronic Gastroparesis and looked up this “side stitch” side ache because I have this ache severely after I vomit. I have had it off and on for a year or so but notice recently it isn’t going away near as quickly and has been hurting now for almost two days….I just wanted to make sure that I wasn’t in trouble and had injured something from the strain of vomiting. Thank you for your help….I will assume that I’m not hurting myself and that I don’t need to go see the doc AGAIN…..
Don’t bother. The only way of ‘checking out’ whether someone has appendicitis is to open them up and have a look, x-rays and ultrasounds and CT scans and MRIs are not accurate enough to diagnose or exclude appendicitis. If you do have appendicitis, you’ll know about it soon enough when you have a pain in your gut that really REALLY hurts. I have had those side aches for 3 yrs…No idea what causes it..Did you ever find out what causes yours? I have had Ulcerative Colitis for 3 decades now and last Nov 2012 my Gastro enterologist told me I was now on the higher table of getting Colon Cancer. I was brought into hospital to have a Colonoscopy but the week prior to going into hospital I was vomiting projectile style and had the runs. The nurses proceeded to give me the prep to clean out my system but I pleaded with them telling them I have nothing in my stomach as I had not been able to eat all week due to being ill, vomiting and having very loose stools. It went on deaf ears and all that did happen when I took the 4 litres of prep was I pee’d a lot and vomiting bile from my stomach! To my surprise the next day I was told by the nurse I was being sent home without having my colonosvopy! I asked why? The nurse told me it was because the prep didn’t work – I told her it had NOTHING to work on because as I keep telling you I have had nothing to eat for 8 days because of vomiting etc. I was ignored and this really angered me. I demanded to speak to a doctor but was told they were all busy in surgery. I was then informed I would be called back to have a CT scan and was I allergic to iodine? I told the nurse I did not know? I left the hospital feeling very deflated, why didn’t they believe me?? Anyhow that was on the 4th July 2013 when I was in hospital – it is today 31st July and I have still not heard anything about having this CT scan so I rang to enquire why – I was told there is a waiting list and I have another 3 weeks or so before I get my appointment to have the CT scan – I could not believe this! I live on my own and yes my imagination runs a little wild at times but seriously I am stressed out because I am worried in case it is Colon Cancer. Then on Friday 4 days ago I get this constant stitch like pain in my left side under my ribs – it hurts more when I lie down on my left side – what do you think it is? I have read your journal and noticed the possibility of it being appendicitis?? Do you think this is what I have? There is one easy way to stop “side-stitch” while running! Naturally, humans tend to exhale on their right foot whilst running, and as your liver is on the right side, this, over time means your liver will tug against your rib-cage! To fix this, train yourself to exhale when your left foot strikes the ground. Problem solved! Can laughing alot cause a side ache? Last night, I was laughing too much and I woke up with a side ache. Is there anything that you would recommend? what is going on with you. Bless those who do. Umm should I be worried if my shoulder does sometimes hurt while running? It only happens if the running is really vigorous and constant, with little breaks. Please email me the answer because now I’m worried if there’s something wrong with me. I use to run at evening after whole day sitting in the office. I can’t make upto 1000 meter in a one straight shot. Feels severe pain on my both sides. I was of the opinion that these are my side ribs edges hitting abdominal muscles which ultimately are causing pain. Thanks to this article for making things clear to me. I would better warm up onward before start running abruptly. Is it when you are exercising, or when you are still? If it is when you are still, you should go to a doctor as this may be something serious. If it is when you are exercising, then it is just a stitch in your side and this article described how to avoid it. Before exercising, you should stretch the muscles you will be using. For example when running you should stretch your legs and take a mildly slow walk for at least one minute before running (go somewhere else to find leg stretches, I’m not the one to ask about that.) Make sure to breath evenly when you exercise. Don’t breathe in tune to your steps when you run. If you need to, count about five seconds, breath in deeply. Count another five seconds, breath deeply out. Make sure that you are not breathing through your chest, but through your diaphragm. Find guides on this is you need clarification. If anyone wonders why I am posting this a year late, other people could easily come across it and find it useful.